This ninth book in the Discworld series is short and sweet - and, unsurprisingly, very funny. I was delighted when I discovered that Rincewind, the protagonist of the very first Discworld book (and several others), returns - after a harrowing cliff-hanger left him languishing in a very unpleasant place. Rincewind, incompetent wizard extraordinaire, is brought back from that unpleasant place in this book - by Eric, an adolescent wannabe wizard who is trying to raise a demon in order to get three very predictable and prosaic wishes granted. Instead of a demon, he gets Rincewind - whom Eric is convinced is a demon, for demons lie, of course. The appearance of the Luggage doesn't help Rincewind's case, either. 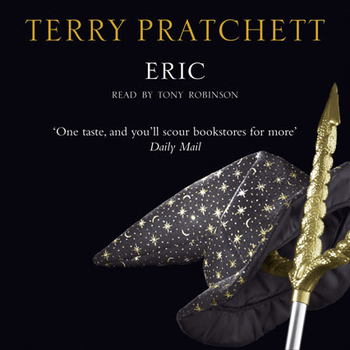 Rincewind finds himself obligated to attempt to fulfill Eric's wishes, which, in the classic way of every three-wishes story, goes terribly wrong, and in the classic way of Discworld stories, the results are hilarious. This one is more a novella than a full-fledged Discworld novel, and therefore it isn't as complex as other, longer books in the series. It is a lot of fun, though, and what a treat to get to spend some time with Rincewind - and the Luggage (which is definitely the hands-down most engaging piece of furniture ever to appear in literature). There is the usual amusing satire and social commentary, and this one has a lot of fun poking fun at the adoption of a particular business model (in Hell, of all places) regardless of the suitability of the particular approach, which those readers who have experienced such things in the workplace are sure to appreciate. The humor and satire are there, but they never supersede the importance of the characters and the story itself, which is why I love these books. 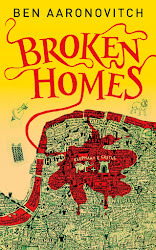 A Book a Week: "A perfect cottage afternoon read, which is what it was for me." The Wertzone: "...a very fast, briefly entertaining diversion from the main Discworld sequence." Eric is actually the next Rincewind book on my list to read. It sounds very good (how could it be otherwise?) I've never been much of a Rincewind fan but am rapidly revising my opinion. "the Luggage (which is definitely the hands-down most engaging piece of furniture ever to appear in literature)" -- Hear hear! Such a fun little book. I thought it was the perfect length for the concept, really. 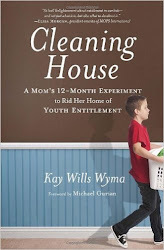 Btw, I should have mentioned: I love your "currently reading" sidebar. Might have to copy that, do you mind?